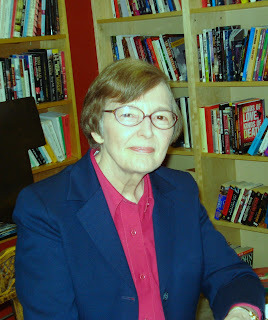 Marion Moore Hill, author of the Scrappy Librarian mysteries, and the Deadly Past books, appeared at The Poisoned Pen Bookstore in Scottsdale, AZ on Friday, Feb. 13 and Saturday, Feb. 14. On Friday night, I acted as facilitator. Fortunately, I really only introduced Hill and her books, and she took it from there. Hill started by saying although she writes the Scrappy Librarian series, she is not a librarian. But, that series began with the character of Juanita Wills. Hill thought librarians tended to be stereotyped, either as the quiet type who would not make a sound, or as the sergeant types, always hushing people. She said the librarians she knew were not like that. They were interested in a lot of subjects. And, many of them had a wicked sense of humor. She also addressed the problem I had with her character when I read Death Books a Return. She admitted Juanita wasn't in the library a lot. I admit, I had a problem with that because I couldn't suspense my disbelief enough to accept a Library Director who had the time to run all around two towns during the work day, working on projects outside of the library. Bookmarked for Murder, the first Scrappy Librarian book, was about hate groups, and the realization that many residents of towns aren't even aware of the hate groups in their midst. Juanita Wills worked late at the library one night, and, while walking home, saw three men run out of a church. They all had their faces covered. Juanita was frightened, but she heard sounds coming from the church. Upon entering, she found the minister, who had been beaten unconscious. And, there was a hate message on the wall. Death Books a Return is the second mystery in the Scrappy Librarian series. As Library Director in Wyndham, Oklahoma (a made-up town, somewhere near Tulsa), Juanita is working on a local history. She learns about a murder fifty years earlier that the police never investigated. In Oklahoma, in the 1950s, there were Sundown towns, ones with signs that said black people should not be in town after the sun went down. There were also all-black towns. After the Civil War, Oklahoma had the largest number of all-black towns in the country. They were communities with businesses, law firms, stores. But, many died out in the twentieth century, particularly the 1930s, during the Depression. The businesses had been dependent on the railroads, and many of them went out of business. The story surrounds the death of a young black man in Wyndham in 1959. Why was he in town after sundown? Hill said she already has an idea for the third book in the series. Juanita Wills will become a literacy tutor. Hill, herself, has been one for about twenty years. The Deadly Past books, Marion Moore Hill's other mystery series, started with Deadly Will. While doing historical research, Hill learned that Ben Franklin's will set aside money for towns he was associated with, but the money was to earn interest for 200 years before the towns received it. In 1990, those cities received millions of dollars. Hill invented a fictitious acquaintance of Franklin's, Nathan Henry, who also leaves money to his descendants after 200 years. But, some of them die under mysterious circumstances. Henry also left items to be given to his heirs by lottery, and by that time, there are some valuable antiques, including a quilt made by Betsy Ross. It was obvious that Hill enjoys the research, and the contacts made while doing research. She discussed the experts who helped her with information about early American antiques, quilts, and even the history of fabrics. When questioned about the hate groups, Hill said she became interested after the story from Texas a few years ago in which a black man was tied to a car, and dragged behind it. She said a lot of things have gotten better, but there is still racism. She wanted to write about an old murder because the story drew her. She said she did not interview members of hate groups, but she did a great deal of reading. Marion Moore Hill said her librarian character, Juanita Wills, was not modeled on any particular person. She's a composite of a number of librarians. Hill admitted she's particularly found of Wills' assistant librarians, Calvin and Mavis. They don't like each other, but they have an on-going quote war, in which they try to top each other with opposing quotations. She did say there is a little of her in every character, even the villains. She tries to think of the villains, and how they'd think of themselves. Hill said she read Nancy Drew and other mysteries when she was young, and she wanted to write mysteries. But, she majored in journalism, and went on to be a newspaper reporter, and write ad copy. Twenty years ago, she started writing fiction, but discovered she was not very good at it. She had been teaching writing, but learned that writing is very different from analyzing and teaching fiction. It was very helpful for her to be in critique groups. She has been in three of them, starting with one formed by her friend, Billie Letts. Hill's next book is in the Deadly Past series. Deadly Design, due out in September, is set in Virginia. The main character, after inheriting money in the previous book, is now in college studying history and literature. It deals with Lynchburg, Virginia, where Thomas Jefferson's second home, Poplar Forest was located. Poplar Forest, a three day horseback ride from Monticello, was Jefferson's getaway home. It's an octagonal house, with octagonal rooms, and a dining room in the center. Hill and her husband volunteered for a week there one summer, helping the archaeologists. They are still working on the grounds, uncovering slave quarters, gardens and buildings. She admitted she had to do a great deal of revision to this book, because she had too much research in it, and needed to let the story come through. 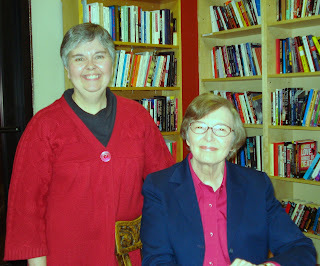 One of Marion Moore Hill's final comments was about her publisher, Pemberley Press. She said she likes working with them, because they allow the author to make suggestions for the covers, and agree to the final design. Death Books a Return is just one of those mysteries with a very attractive cover. Check it out. 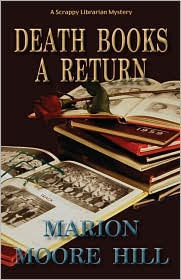 Death Books a Return by Marion Moore Hill. Pemberley Press, ©2008. ISBN 978-0-0771913-6-9 (paperback), 284p. After reading your post, I think I will check her out! I was on a panel with Marion at Bouchercon last year, and she is a delightful person with a surprising sense of humor. She is very nice, isn't she, L.J.? Thanks for the note! I've not ever heard of these books or the author, but now I'm going to go looking for them. Thanks Lesa for using your great blog to introduce us to all sorts of different writers. Thank you, Caryn! That's the nicest compliment you could give me. I don't think our library has these books. Maybe I can get them through ILL. Thanks for sharing, Lesa! I'm sure you can, Kay. Oklahoma libraries should have them.